No grill? No problem. There's no reason you can't enjoy the flavor of summer even without a grill (or a grill pan, for that matter). 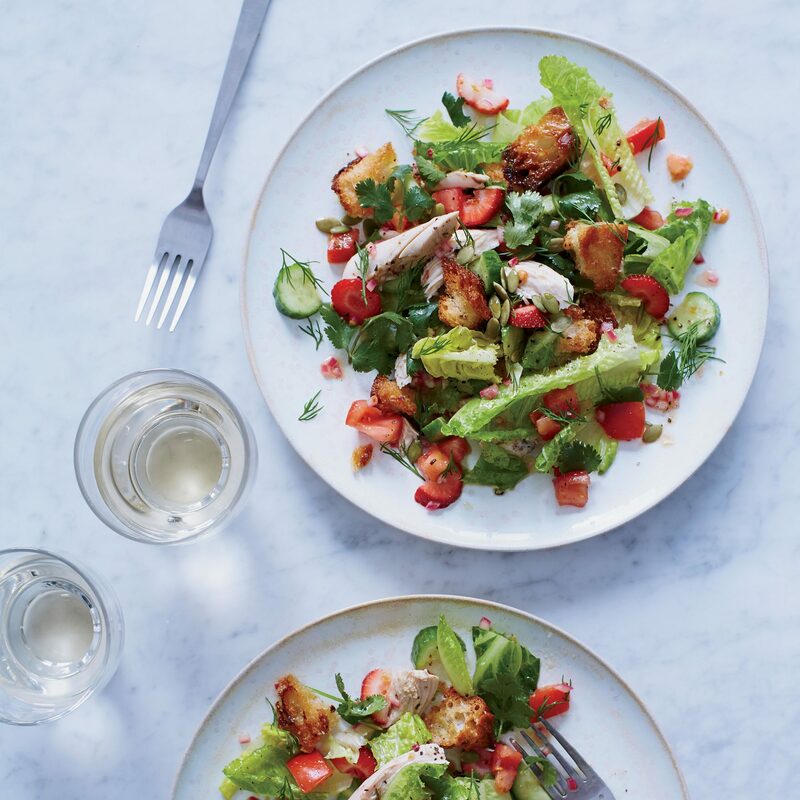 For the nights you're feeling the grilling FOMO, here are plenty of recipes that will scratch the itch for summer cookout vibes. The food processor brings these meatless patties together in a flash. Another bonus? A new Harvard study found that those who regularly ate a healthy plant-based diet (like this burger) significantly lowered their risk of heart disease. Ground flaxseed adds body to the burgers. Lamb loin chops (shaped like mini T-bones) save about 11g sat fat per serving over rib or shoulder chops. You can also ask your butcher to cut "steaks" from a leg of lamb, also lean, or sub 2 (8-ounce) beef sirloin steaks. Inspired by the classic cocktail, these bold-flavored burgers make a fantastic brunch entrée. For an extra umami kick, whisk 1 to 2 teaspoons vodka into the sauce. You don't need a grill for a perfect plate of BBQ ribs. Toss the meat right into slow cooker and pour the sweet and savory sauce right over it. Cook it low and slow to perfection. The slightly vinegary pickled cabbage balances out the nutty, creamy sauce in this pan-fried vegetarian patty. Roasting the corn under the broiler adds a little smoky flavor and also a "meatier" texture, more like the corn used in Mexico, which is less sugar-sweet than ours. This snack is a popular street food in Mexico, and it's made inroads in the U.S. in recent years, popping up everywhere from county fairs to ballpark concession stands. Microwaving the potatoes gets them tender in minutes; roasting gets them the crispy edge we love. This balanced summer dinner is a great weeknight meal that the family will enjoy without a grill in sight. This single-skillet supper may sound highbrow (and look the part too), but trust us, it’s about as simple as it gets. Perfectly pan searing a succulent cut of steak is one of those essential kitchen skills that every home cook needs in order to whip up an impressive, company-worth meal on the fly or simply to treat yo’self at the end of an exceptionally long day. Scoring the skin allows for fast, even cooking and super crisp texture. Look for snapper from the Gulf of Mexico, or use one of the recommended substitutes. Heating steaks in a frying pan allows for the sauce to retain the flavors of the meat itself. Nothing says summer like fresh corn on the cob. Here is a favorite flavor combo for buttering them up with a touch o curry powder and turmeric. This method makes French-style cooking easy. Each parcel of fish and veggies steams with its own delicious juices (a technique called en papillote). The package concentrates the flavors, and when opened at the table, it releases a dramatic cloud of aromatic steam. Butter up a boiled corn on the cob with a delicious blend of orange juice, fresh tarragon, and sliced basil. Sliders make any burger night more fun, especially since you get double the patties and double the creamy, crunchy slaw. Look for ground turkey rather than ground turkey breast--the former has a bit more fat and flavor from dark meat while still keeping a lean profile. Whether you're planning for pint-size palates or simply desire to serve appetizer-sized portions of the American classic, these baked mini burgers are a guaranteed crowd pleaser. The salsa combines sweetness from watermelon; acid from tomatoes and lime; a bit of heat from the chile; and a pop of herbal freshness from cilantro and mint. It pairs particularly well with red snapper and would be lovely with most any mild white fish. This summery sauté of corn and bacon makes a simply delicious side dish. In addition to the mayo mixed into the patties, we also stir in caramelized onions to help with juiciness and offer a flavor boost. Use a cast iron skillet for a perfect, crispy bite. What an impressive dish for just a handful of ingredients and an easy skillet sear! For a budget-friendly swap, try this recipe with mahimahi. Cutting down on the fat doesn’t mean cutting out any flavor with this oven “fried” chicken, featuring a savory spice rub and a sweet, tangy peach barbecue sauce. Cooking your chicken at a high temperature in the oven means you won’t need additional oil in order to get super-crispy skin. These simple, vibrant tacos rely largely on super fresh ingredients for the fullest flavor potential. Opt for just-ripe avocados and tuna from a source you trust. Heating steaks perfectly on a cast iron skillet can be easier than you think. To make your next steak night a success, watch over the temperature of the meat with a thermometer. This works best on steaks of 1-inch (or more) thickness; it's hard to get a good reading on anything thinner. A fresh batch of boiled corn on the cob get a makeover with fresh chives and bit of zesty lemon. Mahimahi has a sturdy, dense texture that holds up to the marinade (more delicate fish like snapper or tilapia would cure in the lime juice). If using a lighter fish, skip the marinade and squeeze a lime wedge over the fish after cooking instead. We've embellished the humble carrot to mimic the smoky taste and snappy texture of a hot dog. To lend a dairy-free cheesy flavor to plant-based nacho sauce, we use nutritional yeast; look for it in health food stores or well-stocked specialty grocers. Ladies and gentleman, meet your new favorite single-skillet supper. When done right, a pan-seared hanger steak is one of the most delicious cuts of beef you’ll ever eat. Perfectly pan searing a steak is one of those essential kitchen skills that every home cook should master (don’t worry, it’s easy) in order to whip up an impressive, company-worth meal at the last minute or simply to treat yourself and/or your family to a special meal—any night of the week. These baby back ribs offer classic BBQ flavor, but are made simple in the oven. Rich and perfectly tangy-sweet, the homemade barbecue sauce used for this recipe is nothing short of divine, but feel free to use your favorite bottle in a pinch. Wrapping the ribs in foil helps to keep them moist throughout the low and slow cook time, while broiling at the end gives them a deliciously crispy crust. Lather a fresh boiled corn on the cob in butter blended with lime juice and honey. Finally, sprinkle over a little chipotle chile powder. There's no need to toss a whole fish on the grill when you can make it just as delicious in the oven. A Chinese-inspired sauce makes for a delicious dinner. Baked pork belly with the right spice rub makes for an impressively crispy, charred crust. Slice it up and serve it Cuban-style for a perfect summer dinner. Sear the cod fillets in the bacon drippings first to get a good crust; then add back to the pan, and cover so they can steam and impart their juices to the vegetable mixture. A completo is a very popular Chilean signature on the concept of a “loaded” hot dog. Served by street vendors and other casual restaurants, this dish consists of your basic boiled hot dog on a bun topped with sauerkraut, diced tomatoes, mashed avocado, and a generous drizzle of mayonnaise. Firm white fish like grouper, tilapia, and mahimahi are perfect for crusty sandwiches because they won't fall apart after cooking under the broiler. When you’re going for a mouthwatering BBQ experience done indoors, these Instant Pot Baby Back Ribs are the way to go. Using the Instant Pot creates incredibly succulent ribs with virtually no fuss; you even make your sauce right in the pot. Finishing these honey-soy ribs under the broiler creates a nice, crispy exterior crust, but you can bypass this step if you want to avoid heating the oven at all. These are the ultimate veggie burgers, made from black beans and a handful of warm spices. Top with pepper-Jack cheese and fresh pico de gallo for a summer smash. For a fresh summer side dish, try this sauté of corn, green onion, and red bell pepper. A fresh tomatillo salsa is the perfect topper to stove-top fish. The fried sea beans are an unexpected addition. Make sure to process the mushrooms just until coarsely chopped (about 4 pulses) so they match the texture of the ground beef. The mushroom mixture will look a little wet in the pan at first; take the time to let as much liquid as possible cook out for a richer patty that will hold its shape when seared in the pan. Simply patties cooked under the broiler make for a great addition to a fresh summer salad. Photography: Caitlin Bensel; Food Styling: Anna Hampton; Prop Styling: Lindsey Lower. Cutting fish into escalopes (thin slices)--as the famous Troisgros restaurant family in France does--facilitates fast cooking and delicate searing. Serve with sautéed veggies such as Soy-Glazed Vegetables. Use white pepper on the fish for an earthy flavor with less heat. Black pepper adds specks of color and a hotter taste. These skillet burgers also work with any other canned bean variety. Pile it high with red onion, creamy avocado, and a juicy tomato slice. While cooking a whole fish definitely seems intimidating, this is the recipe to show you just how easy it really is. But don’t worry, no one has to know—because it’s gonna look ridiculously impressive when served, no matter what. Roasting a whole fish on a sheet pan like we do here is exponentially easier than tackling it on the grill, as you have less to worry about with temperature control and there’s no flipping required. Rich ground-beef patties studded with caviar make for the ultimate in surf and turf--and decadence. Easy Street Corn Salad comes together in a snap. Simply combine the ingredients with a dash of olive oil and sprinkle with cheese. Now that's summer siding made simple! This is the kind of satisfying, protein-rich veggie burger everyone will love, kicked up with a splash of hot sauce. Photography: Jennifer Causey; Food Styling: Chelsea Zimmer; Prop Styling: Thom Driver. These burger steaks deliver classic meatloaf flavor with more glazy, crispy crust. A quick tomato gravy mimics a savory ketchup topping. 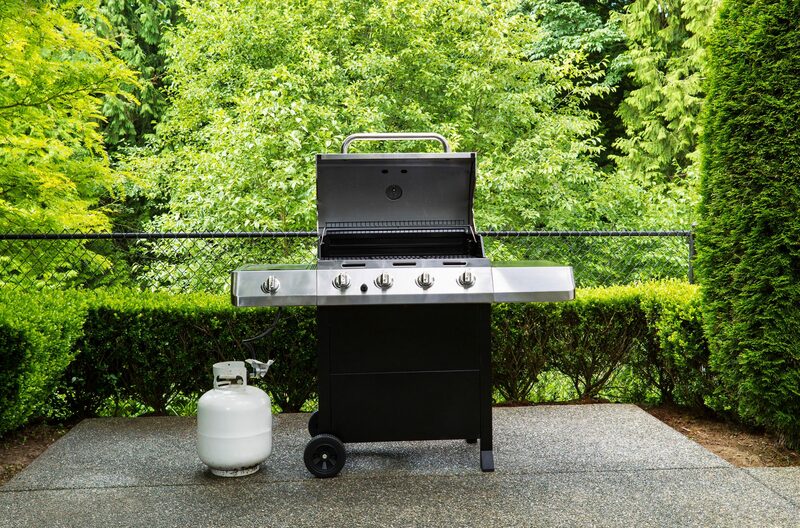 Why Is My Propane Grill Tank Making Hissing Noises?